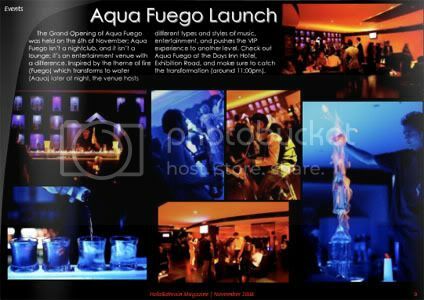 - Aqua Fuego: Newly open, a club with a twist! Aqua Fuego is not your regular nightclub; featuring different talents on selected nights, and amazing fire and water shows, it's definately something worth checking out! 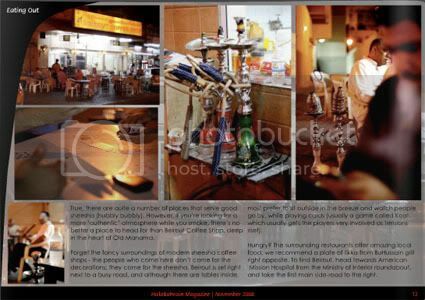 - Gahwt Beirut: A traditional gahwa in the heart of Manama, and probably one serving the best Sheesha in town! A definite hit for hubbly bubbly lovers. - May Alqasim: You won't believe she's Bahraini! This talented 17 year old started singing and playing the piano from a young age, and is breaking borders with her voice! Her first exclusive interview, right here! - Also in this issue: Elham group art events, The Wailers live in Bahrain wih their amazing Reggae tunes, a visit to the traditional Arad Fort, the V8 races at the BIC, and much more!